New Englanders tend to swarm the grocery store anytime there’s snow in the forecast, clearing the shelves of bread, milk and other staples. I guess memories of the Blizzard of ’78 die hard. If there’s an approaching storm, I typically try to avoid the grocery store at all costs. As a recent storm approached, I decided I wanted to take advantage of being snowed in the following day and make salsa, hummus and pita for our snacking enjoyment. I was the crazy lady combing the aisles in search of tahini (found it with the olives!) and packing my basket with cilantro, jalapeños, garbanzo beans, canned tomato and a bag of flour…not exactly your typical snowstorm fare. Alas, I was unable to carry out my culinary plans, as two downed telephone poles in the vicinity caused us to lose power for the better part of the day. No internet or kitchen appliances…how unfortunate! Tragic, even. A few days later, I put my food processor through it’s paces and made all of the things that I had planned to enjoy on my snow day. A dear friend described his wife’s stand mixer as something that “you put things in and food comes out.” I have to say, this pretty much describes my sturdy 9-cup food processor too! In mere minutes, I was able to throw together a tasty, custom batch of hummus . I used this recipe as a general basis for ingredients and quantities, but adjusted things quite a bit. This really is the wonderful thing about making your own hummus – you can tweak the ingredients to your heart’s content. Love garlic? Throw in several cloves! Prefer a tangier flavor? Add some more lemon. The options are endless. Grab a can of garbanzo beans and tahini (try to avoid the snow storm crowds!) and get pureeing! 1. Place the garbanzo beans, tahini, lemon juice, salt, garlic, olive oil and cumin in a blender or food processor. Blend until smooth. 2. 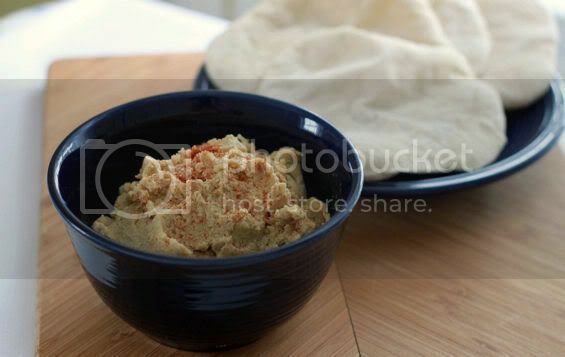 Add small amounts of water or liquid from the canned beans to the hummus, blending well to achieve desired consistency.